Since writing my book which disclosed more than 200 un-announced Mars artifacts in 2005 , I’ve been periodically looking at what’s been happening since with the Rovers. All the rovers sent to Mars, including the recent non-mobile Phoenix Lander are all solar powered. Both Mars Rovers should have died more than three years ago. 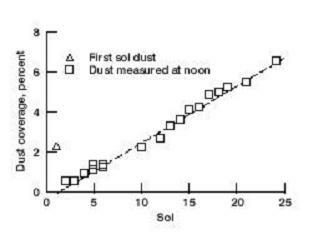 In the above chart we can see that dust is deposited quite quickly. A solar panel consists of solar cells wired in both series and parallel. If an array of solar cells is wired in parallel, any one cell covered up by dust or a shadow will not significantly affect the total power generated by dozens or hundreds of cells. However, in a series connected array, when just one solar cell is covered the entire voltage output will drop to zero. If you have a solar powered calculator, you can test this principle for yourself by covering up just one cell in the window with your finger. It would be remiss if we didn’t discuss the mystery “dust devils” that seem to wander the planet. First, NASA has concluded that rocks on Mars are very similar in chemical composition to rocks on Earth. This would cause Mars dust to be very similar, if not the same as dust found on Earth. Some theories suggest that the every-present dust on Mars is essentially the same material that planet’s rocks are made of. With this in mind we add into the equation the NASA statement that “Mars’ atmosphere is just 1% that of Earth.” Essentially it’s almost a vacuum for purposes of discussion. If true, how could dust devils be created and if so, how can such a thin atmosphere make rock-like material airborne? “There-in lies the rub” as the expression goes. But as we shall see, this story gets even more interesting. Equally questionable is how solar panels on two of the three Mars rovers are cleaned on a regular basis. NASA speaks little about the tiny little Pathfinder Rover, which was the first mobile rover to land on Mars. It functioned for just a few months before going silent. Dust was blamed for the silence when the solar panels were finally covered with enough dust to prevent recharging batteries. Apparently there wasn’t anything to clean Pathfinder’s solar panels ­ even though it landed near the equator as Spirit and Opportunity also have. When Spirit and Opportunity missions were announced, NASA stated that because of dust deposition on solar panels these spacecraft would only function a few months and then go silent Yet here we are in the future about four years later – and both rovers are still working! While examining Mars rover images I discovered that NASA has a peculiar fascination with the sundials on the rovers. For discussion purposes we’ll arbitrarily look at the Opportunity rover in this report. To examine dust deposition we need to look at a close-up images of the Opportunity Rover itself. Day 1472 of the mission was chosen at random and used for the following analysis. It also has some interesting photos of the rover itself. This photo is a great example of the mysterious deep-cleaning action, and perhaps is why NASA took it. We can see bare metal (green arrows) even after years after being exposed to the Mars dust deposition process. 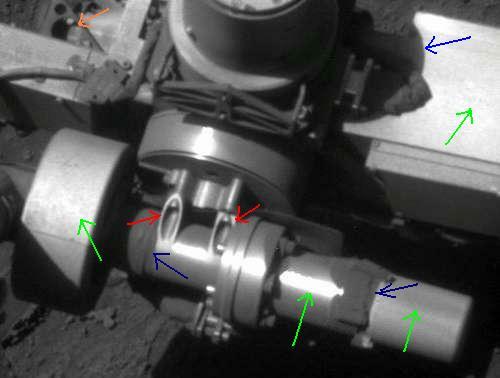 Yet there is dust on and around the mechanism (blue arrows.) Orange arrow points to an opening in a metal bracket, and through the hole we see no dust. Red arrows point to screw mounts in a casting also free of dust. These parts are made of aluminum. If we assume that a dust devil is cleaning the rovers, then how could dust be removed from tiny spaces and yet be left on open metal? * Dust devils roam the planet randomly but somehow clean solar panels just before the rovers go dead ­ for several years in a row. * BOTH rovers are being cleaned regularly, even though located on opposite sides of Mars. * The tiny Pathfinder rover was never cleaned and went silent. Did you notice something else different in the two images? The crown-like object near the base of the shaft is not present in the Earth image. 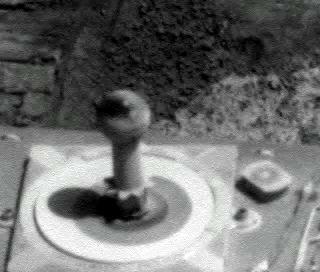 Yet Cornell claims this is the actual sundial used on both rovers. Here we see some light dust deposited on the sundial in Fig. 3. The argument about differing electrostatic effects would not seem to apply, since the objects in Fig. 2 and Fig. 3 are both made of aluminum and grounded to the rover. Fig. 4 ­ Another photo of the SAME sundial also on Mars day 1472. Now we clearly see more of the elusive dust. This image was probably taken with a different filter than the image in Fig. 3 but we cannot know for sure. NASA has stopped adding filter details to their rover images. Here it appears that something disturbed the dust on top of the ball. Based on the inconsistent, bizarre data from NASA I have a possible theory. There is dust on the vehicle – but it is SELECTIVE dust. That is, dust which is either left there or placed there in areas which will not prevent the rovers from functioning. This also implies that someone may be cleaning them periodically, too. That is, wherever they are actually located. Something MAJOR Happened On Mars.. Are They Hiding It? NASA Announces Lunar “Gateway” Orbiter By 2024, And Russia Is Participating! Mars, Antarctica, Greenland, and Italy: What’s The Real Story? I, Pet Goat 2: Did it Predict Recent Events? Extinction Rebellion: Much Protest About Nothing?